So you’ve decided to go with an artificial Christmas tree this holiday season, great choice! Imitation Christmas trees provide a long list of benefits including being reusable, cost efficient, low maintenance and cleaner than that of a traditional real Christmas tree. 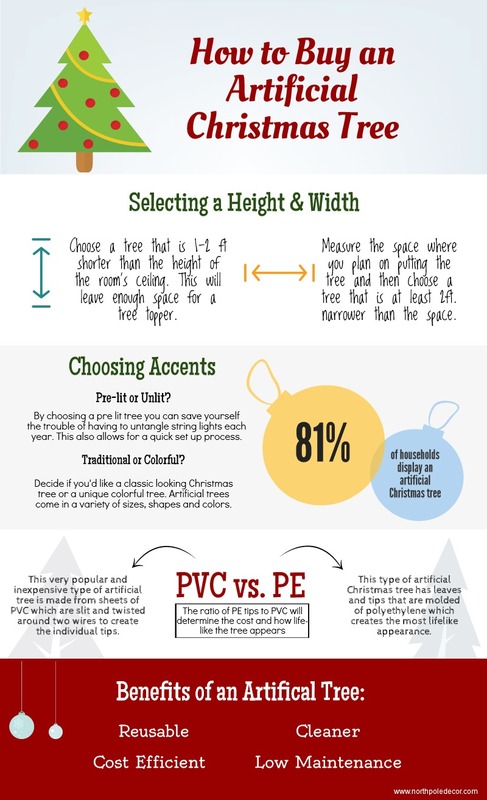 However shopping for the perfect tree can be difficult if you’re not sure on what aspects to focus on. When choosing the perfect artificial Christmas tree for your space, it’s important to narrow it down to trees that are 1-2 ft. shorter than the height of your room’s ceiling, this will leave enough space for a tree topper. Then measure the space where you plan on putting the tree and choose a tree that is at least 2ft. narrower than the space. Fake Christmas trees often offer additional features such as being prelit, colorful or having frosted branches. Decide on which features are important to you and be sure to include them online search or look for them when shopping in stores. Artificial Xmas trees come in a wide variety of sizes and types that can accommodate any budget or space.